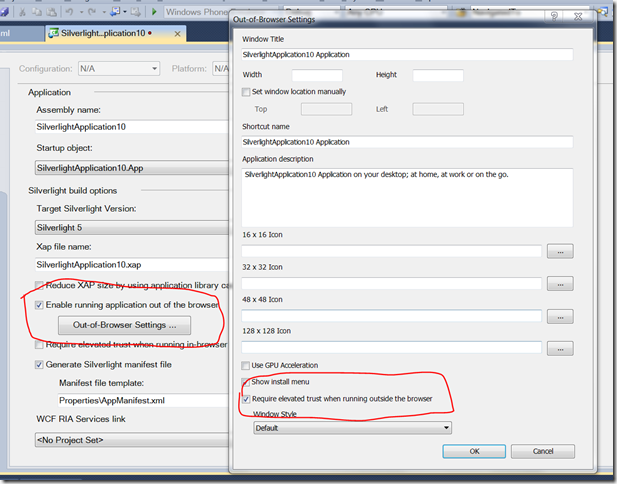 One of the big features of Silverlight 5 for me is platform invocation. If you’ve been around .NET for a while then you’ll know that this has (since day 1) represented the “get out of jail free card” because it allows .NET code to call into pretty much any native code that is packaged as DLL export functions including the Windows API. 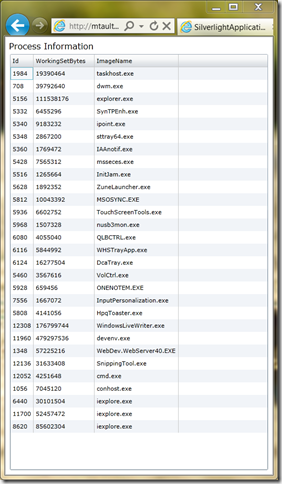 In many ways, this is a further extension of the work that was done in Silverlight 4 which allowed Silverlight code to call into existing COM components registered (by ProgId) on the local machine and which had a scripting interface (i.e. IDispatch). 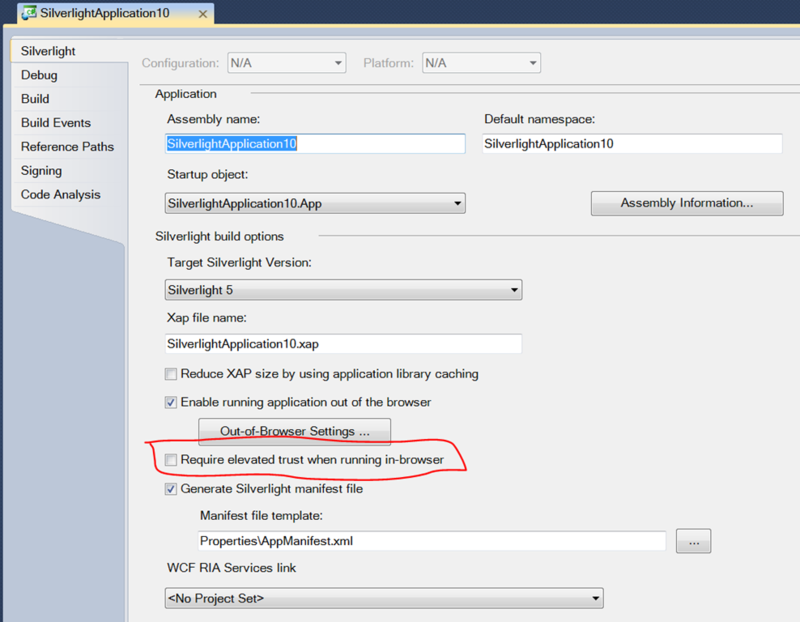 So…Silverlight 4 tried to bridge Silverlight to COM components and Silverlight 5 tries to bridge Silverlight to DLL exports. 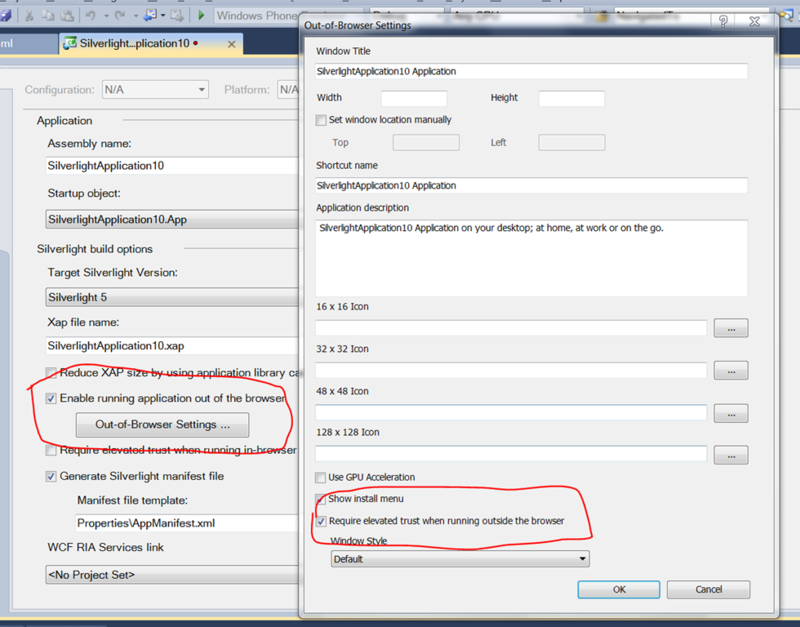 It’s worth saying that this functionality is only available to trusted Silverlight applications and only to applications running on Windows (as was the case with the COM functionality in Silverlight 4). 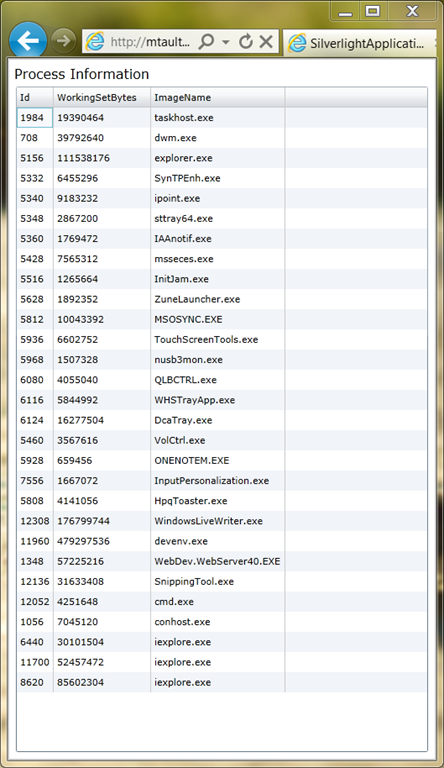 So, how do we go about calling DLL exported functions in Silverlight 5? 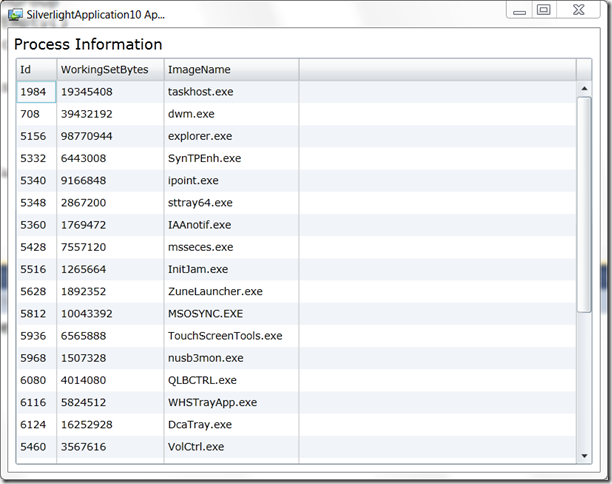 Let’s build a simple “Process Explorer” kind of application that calls a few Windows APIs. Make a new project and ensure that the project is marked as allowing out-of-browser and requiring elevated trust. Note – this is overly simplistic because process IDs get re-used on Windows and I’m pretending here that they don’t and are unique identifiers so that could cause “confusion” in the real world. 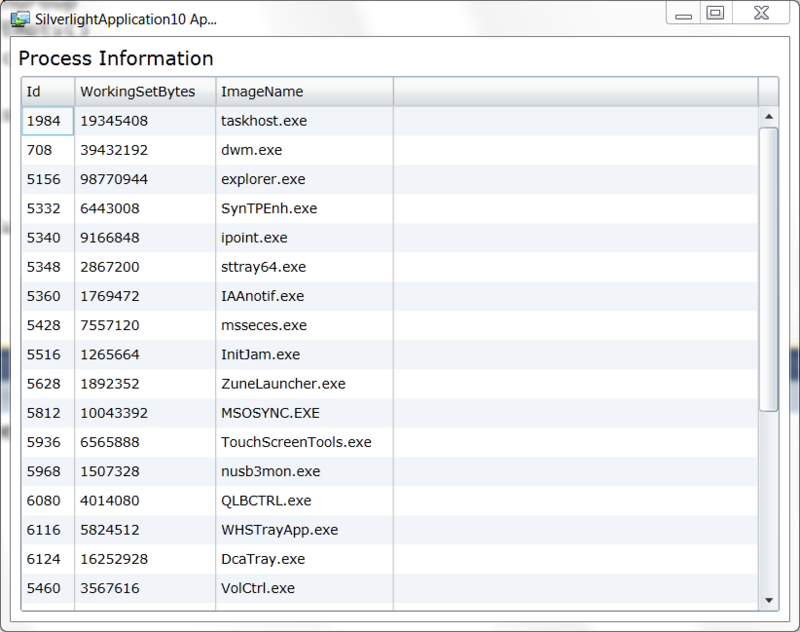 and so this is making use of 5 or so Win32 APIs – EnumProcesses, OpenProcess, CloseHandle, GetProcessImageFileName, GetProcessMemoryInfo in order to build up a picture of a Windows process for display. Note that there’s a bit of a race possible here in that my properties ImageName and WorkingSetBytes might end up stuck with a stale process id and, at the moment, if that happens my code will potentially fail to open the process handle, throw an exception and upset the data-binding so I should really take steps to make that a lot nicer for data-binding. but it’s a (reasonable) example of the sort of things you can do with platform invocation. With Silverlight 5, it’s possible to get this kind of elevated application to work in-browser as I wrote about at some length at the time of the beta. 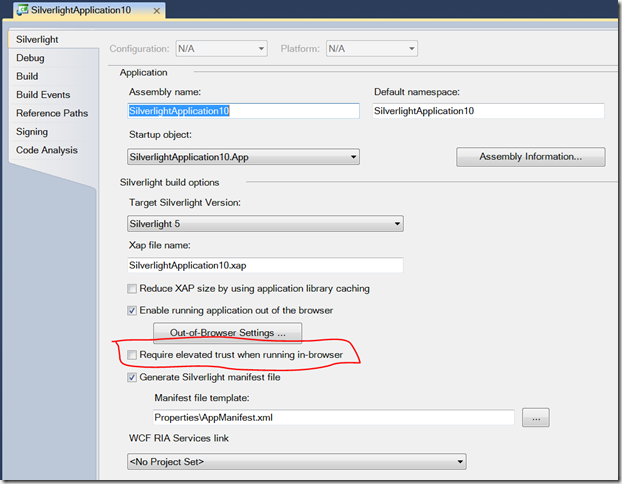 PInvoke is a big addition to Silverlight and in my first experiments here I found it to work exactly the way I would expect it to work coming from a “full .NET” background – it’s great to see this open up Silverlight apps to calling even more code and scenarios than before. You can download the code that I wrote for this post here.